Having wooden deck with furniture can be very lovely place in your home to spend your morning and evening time. Wooden deck can be constructed at all open areas like home garden, backyard and even outside of your home. The shown sample of garden wooden deck is looking very lovely and it has fine and attractive furniture set. 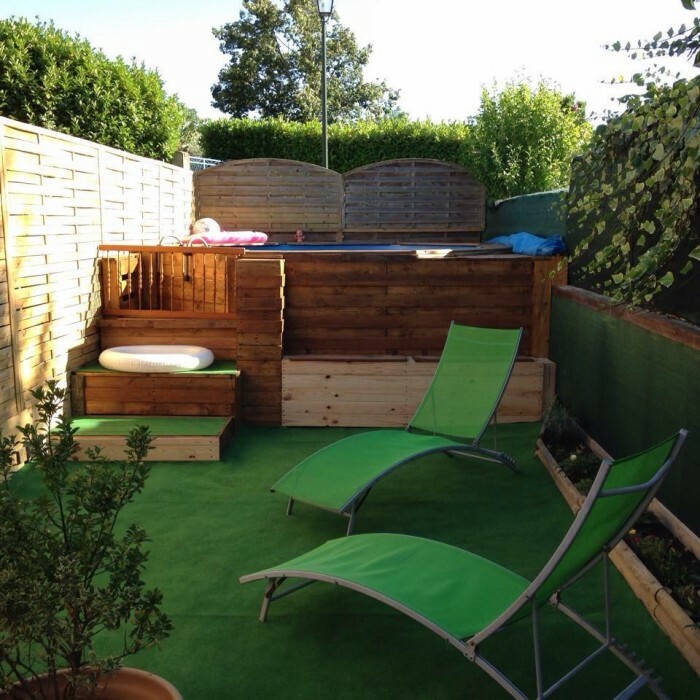 Having such a large wooden project would be very costly but pallet wood is one of suitable and the best stuff to make attractive wooden deck with furniture in your home outdoor. 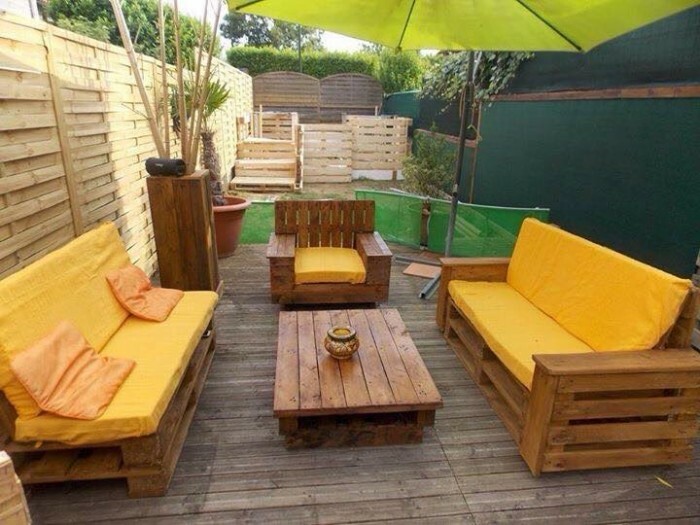 Pallet is such an amazing stuff that garden deck and furniture can be made out of it after doing some handy work on it. Pallet DIY construction and craft ideas are really helping people to have beautiful wooden creations in their homes. Wooden deck and furniture can be created in variety of attractive designs. When you have to do it yourself to make beautiful pallet deck and furniture, you can put your own imagination and creativity to modify the given and shown design for the pallet wooden project. Some wooden decks are constructed in open style to sustain the outdoor and natural environment having beautiful and comfortable furniture sets. A wooden furniture set may consists of a set of chairs and table, sofa and table, benches with table, couches and table, coffee table and whatever you want to have in your garden deck. 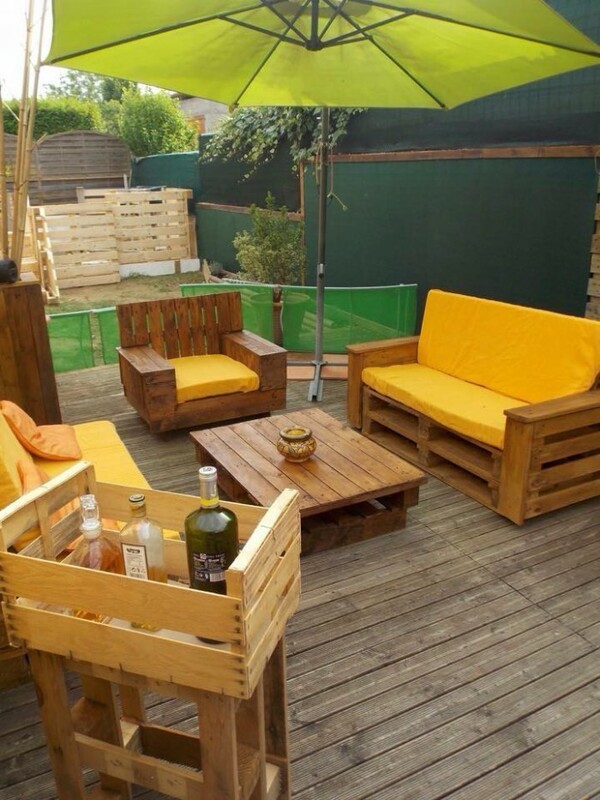 All this is possible to do with pallet wood to enhance decor of your home garden and durable and comfortable furniture with garden deck. You can add different other wooden creations with garden deck and furniture like you can see here; a beautiful pallet made wine bottle stand is placed here. The design for pallet made sofa and center table is really very attractive. Leaving pallet creations and crafts in original appearance of pallet wood is one of most beneficial and the best feature of this wood stuff.